Cut hay is in the foreground. The light green strip middle left is oats. 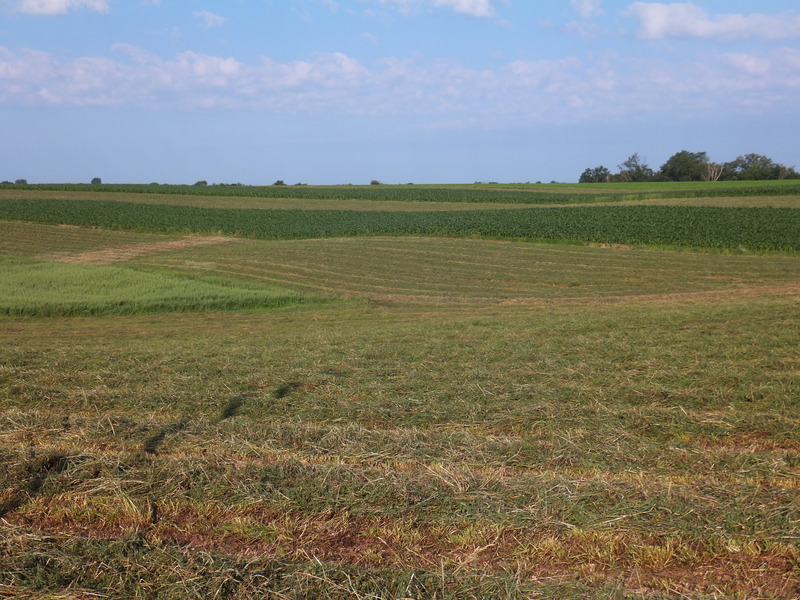 The dark green strips above it are corn. The light green at the top is a hay strip I baled a couple of weeks ago. This entry was posted on Tuesday, July 2nd, 2013 at 9:41 pm and is filed under Curious crops. You can follow any responses to this entry through the RSS 2.0 feed. You can leave a response, or trackback from your own site. I love the look of that. My father was the first farmer in hias area, back in the early fifties, to lay out, with assist from the Soil Conservation Service, contour strips on our gently sloping farm in southeastern Pennsylvania. In due time, it became the way to do things in those parts.